Look to CB2 for some great cheap and chic options, including the Kala Pillow, featuring a collage of bright fabrics in graphic bars. For a summery addition to your living room, look to L.L. Bean's new Maine Isle Throw Pillow collection including the starfish motif in navy cotton. As the Fourth of July approaches and I reflect in my renewed sense of pride in our country, I'm loving the American Pillow Cover Collection from Restoration Hardware, particularly that little boudoir Flag pillow cover. Because there are so many unique, affordable options for pillows from major retailers, as well as local artisans through sites like Etsy, I wouldn't normally advocate for a spending a ton of hard-earned cash. 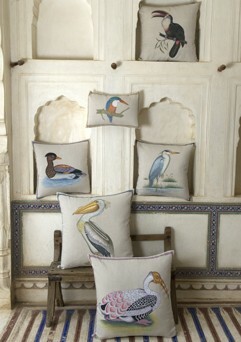 But after catching a glimpse of John Robshaw's new collection which includes a series of stunning handpainted pillows, I'm advocating. If you can spare it, I support it...and feel free to pick up the Painted Stork for me while you're at it.